If you can reverse brain “damage” by effectively treating the patient’s chronic pain, it seems pretty clear that the chronic pain was the cause. This means we don’t have to accept the idea that abnormalities in our brains are what’s causing our pain (which some have hinted at). Recently, local morphologic alterations of the brain in areas ascribable to the transmission of pain were reported in patients suffering from chronic pain. Although some authors discussed these findings as damage or loss of brain gray matter, one of the key questions is whether these structural alterations in the cerebral pain-transmitting network precede or succeed the chronicity of pain. We then investigated a subgroup of these patients (n = 10) 6 weeks and 4 months after total hip replacement surgery, monitoring whole brain structure. 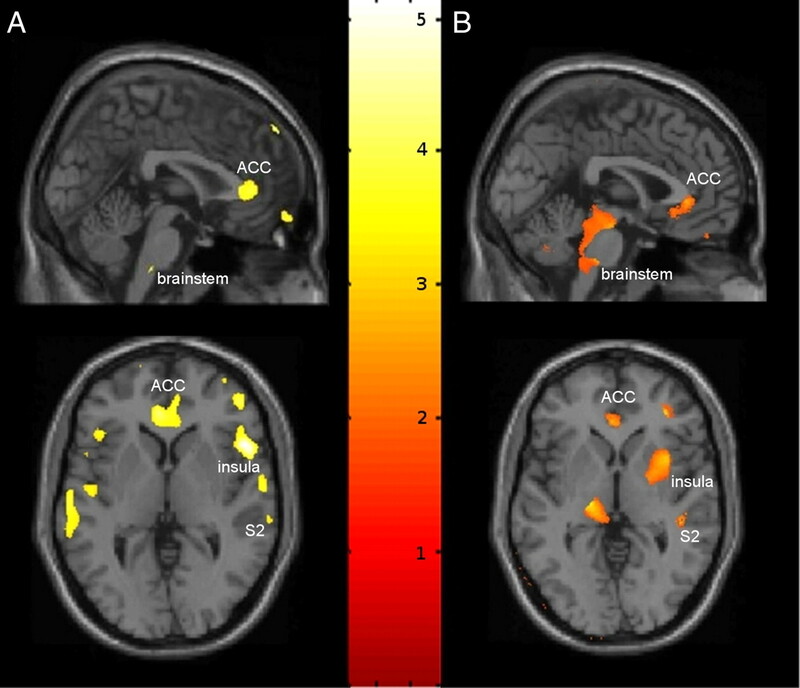 As gray matter decrease is at least partly reversible when pain is successfully treated, we suggest that the gray matter abnormalities found in chronic pain do not reflect brain damage but rather are a reversible consequence of chronic nociceptive transmission, which normalizes when the pain is adequately treated. (2) areas showing an increase in gray matter over time after pain relief in a subgroup of these patients, such as the ACC, DLPFC, amygdala, brainstem, and insular cortex. These data suggest that prolonged nociceptive input due to primary hip osteoarthritis leads to an alteration in morphology and/or cytoarchitecture of anterograde projection areas, which partly recede when the patient is pain free after endoprosthetic joint replacement surgery. At least in these patients, it is unlikely that repeated nociceptive input leading to chronicity of pain over time results in irreversible “damage” and/or “atrophy” to the brain. This entry was posted in Chronic Pain and tagged brain, IMPORTANT, neuroscience, research on March 17, 2019 by Zyp Czyk. I remember reading about pain shrinking the brain. Add that to depression shrinking the brain, & I’m surprised I can’t hear my brain rattling around in my skull like a BB in an empty tuna can. My “gray matter” has been turned into wet cement and trying to follow a thought through it is sometimes just impossible. I hear you, my friend. Though if the way you write & analyze the papers in your blog happen using your wet cement, I cannot imagine how amazing your thought processes are when they are/were at the top of your form! Impressive. Both of you impress me with your intelligence and logic. Reblogged this on Flutterby's Rantings and Ravings.